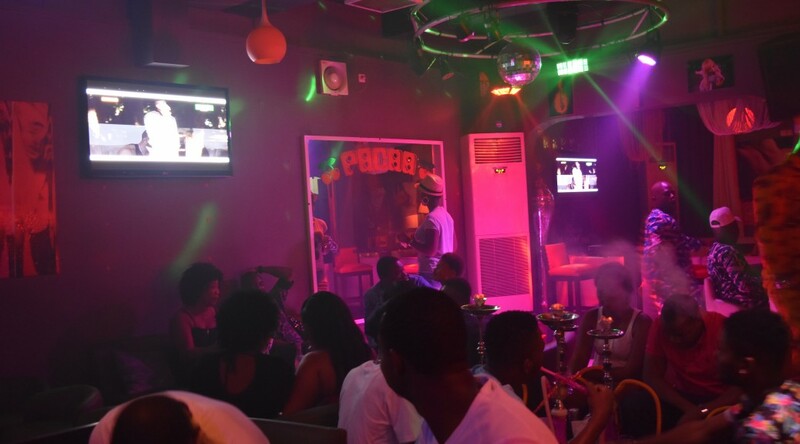 An evening in January 2016, a few days after my arrival in Benin, a friend took me to a “maquis”, an open-air bar restaurant where music is usually played live. When we arrived, the place was quite empty and the band was playing for almost nobody. The stage rather small but full of musicians was at a corner of the open-air space surrounded by table areas. We chose a table near the orchestra and we both sat in a way to be able to look at the stage and get an overview of the venue while being able to talk to each other. I immediately noticed that at the opposite corner of the open-air area, a big plasma screen was competing with the orchestra to catch public attention. 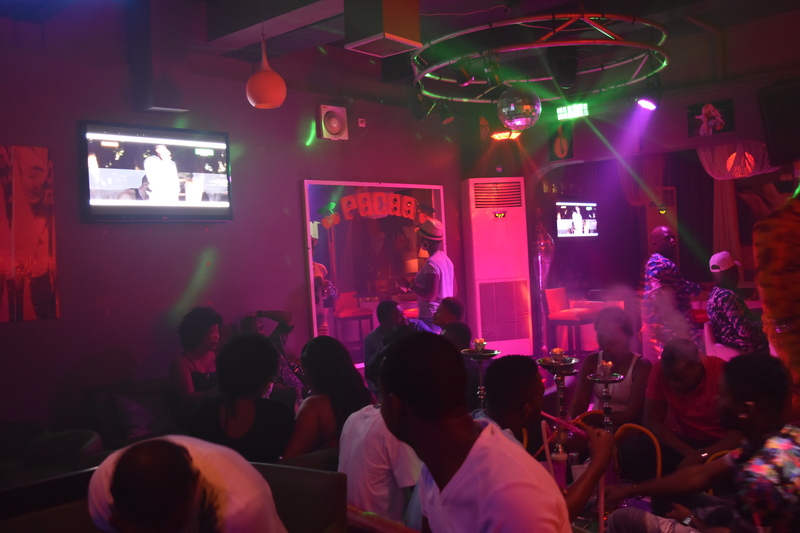 The screen was displaying music videos of West African music dance genres, from Ghanaian azonto to Cameroonian hit “Coller la petite”. The sound was muted to let the acoustic space filled by the music played by the live band. However, a woman was sitting back to the stage and looking at the screen, seeming to give reason to Simon Frith’s observation when he wrote that “music on television is less often heard for its own sake than as a device to get our visual attention” (Frith 2002: 280). How, I wondered, can one look at silent images while a live band is playing right behind one’s back doing his best to catch one’s attention and create a joyful ambiance despite a very limited crowd? This scene immediately took me back to some other interactions between audience and plasma screens within music dance places I experienced in Cuba. 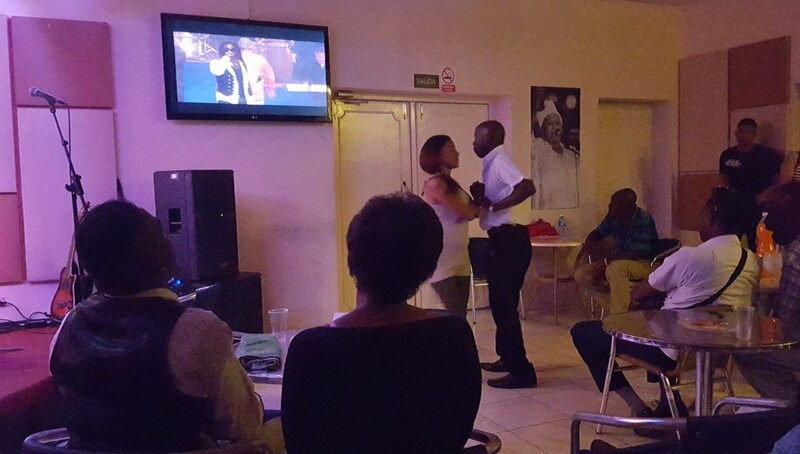 Here I will present some comparative observations I made in Benin and Cuba regarding the role of plasma screens and their interaction with dancing bodies in music dance venues. This interest draws on an ongoing work in progress first using materials from the research I have done in Mali for my PhD, where I could observe how the new media format of the music video radically changed the transmission of dance while allowing for the creation of a new dance genre called “danse de clip” in Mali, a process that I have analysed elsewhere as a process of “videochoreomorphosis”¹. Examining how media are in turn themselves mediated and staged, inserted in the context of a music dance venue where they then become part of a broader performance goes a step further. In a country like Cuba where Internet is a struggle and economically deprived by decades of embargo and socialist plans, a tourist might not get a TV in his habitación in a casa particular but when he does, it will certainly be one of the huge old models. Moreover, according to Robin Moore, “image and marketing have been less central to domestic music-making than in other countries” (Moore 2001: 166). 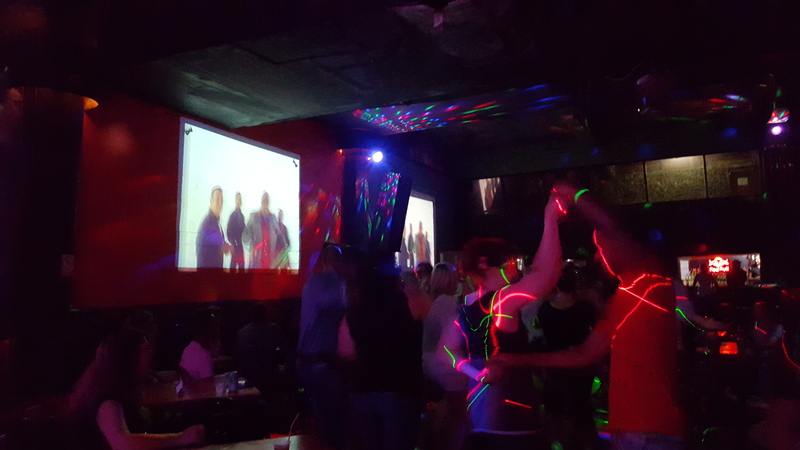 Yet in a lot of music dance places, even in the small ones, there will almost always be at least one if not several plasma screens that broadcast a mix of video clips, live concerts and sometimes candid camera. During my last trip to Cuba in March 2016, I even noticed that the screens observed in a specific place more than one year ago had been replaced by projections on the bare walls of the venue. Therefore, it is not only screens but post-screens as (post?-)mediation tools that we have to engage with to enlighten the intricate layers of cultural products that contribute to shape both Caribbean and African popular culture. Ubiquitous and pervasive, “music that is not just mediated, but on screen or screened has become a global norm, an ordinary fact of life. This is the case even in parts of the world that are relatively unindustrialised, rural and remote” (Mera & Morcom 2009: 4). Linked with the development of a capitalist entertainment industry (Goodwin 1992), the abundance of screens in Cuban venues is particularly striking and seems to act as a manifesto of profusion hiding severe economical struggles: the shelves of the grocery stores might well be half empty, yet the dance music scene is not only beyond lively but the venue’s walls are also adorned with the newest technological tools. Additionally, even though the screens in music dance venues and the music videos as their main content are part of a broader “mediascape” (Appadurai 1996), yet a sense of the local and a personification of the relationship between the venue and the audience are created through them. Behind the screen is a person: the Video-Jockey (VJ). This character uses specific digital tools (Vjing softwares available on Internet), constitutes a database of videos and images, which he will play with throughout the event. He will improvise in live at the same time of the concert performance, thus multiplying the components that are part of the event: the space, the audience (dancing or not), the lights, the sound, the venue’s staff, the musicians on stage, the music played, the screens and the images displayed. With his inputs, he adds his own layer to the narrative and the dramaturgy of the performance. At this stage of the research the empirical materials remain to be completed but I am definitely interested in knowing more about this dramatis personae: how does this person choose and compile the materials that will be linked to the performance? How is the database of images constituted? What are the meanings underlying the different items that are displayed? How improvisation, aesthetics and technical skills are simultaneously combined? The screen does not only display music videos or live concert footages more or less related to the event currently taking place in the venue, it is also used as a promotional tool for both the musicians on stage and the venue that welcomes them. For instance, during the Timbalaye concert I attended at El Jelengue de Areíto in Havana, the screen displayed a loop of photos of the band, concert flyers and musicians portraits. And it so happened for others live band concerts I attended in this venue. The spectator would at the same time see the live body and the screen body of the same musician, either reproducing the same musical gesture with the instrument on stage or showing the human being in other kinds of settings: relaxing, chatting, rehearsing… Different facets of the same character are then being transmitted and perceived, either redoubling the musical life style or on the contrary suggesting another life off the stage. The glimpse at the multifaceted musician’s life one can get when looking at the screens’ efforts throughout the event does not only allow for an understanding of a broader context than the one offered by the stage performance but also expands the scope of what is accessible to the spectator. Musicians on stage and on screens off stage! 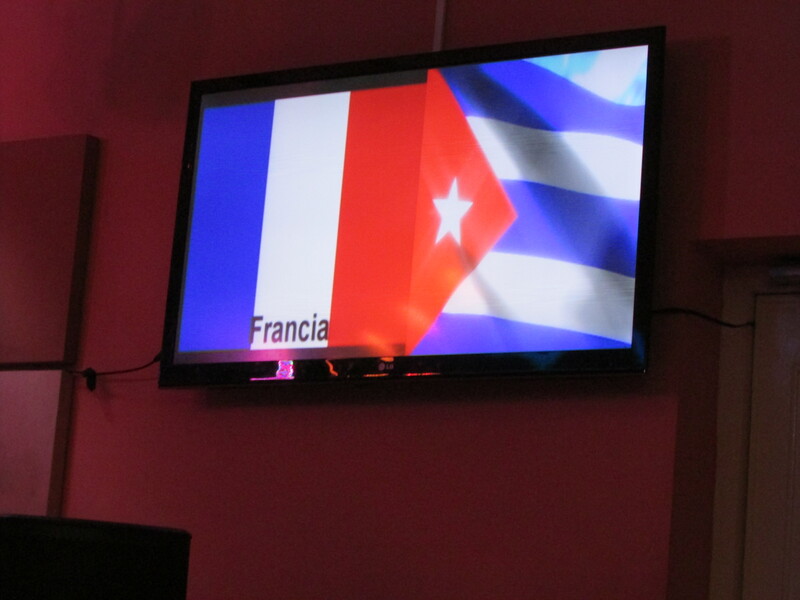 On another level, in a place I frequently went to in Havana, I was known as being French and the French flag was therefore popping up at regular interval on the venue’s screen. And so were some other flags corresponding to other audience members’ nationalities. The flags were inserted as images in-between the on-going display of photo-loops and music videos. Not only was the singer sometimes asking the public where they were from, but the answer was also soon after illustrated on the screen. When I asked the video-jockey in this Cuban venue what was the meaning of the displayed flags on the screen, he told me: “This is a way to greet people, to make them comfortable. 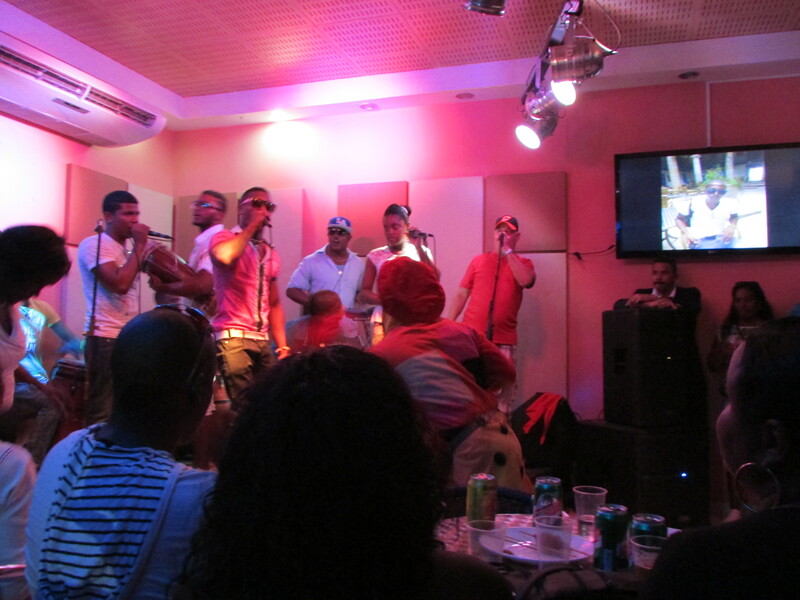 We acknowledge that they are here, that they came all the way from their countries to listen to our music, here in Cuba. We want to make them happy”. In Benin, I observed a similar use of the plasma screen as a mediation tool between the place and the audience. 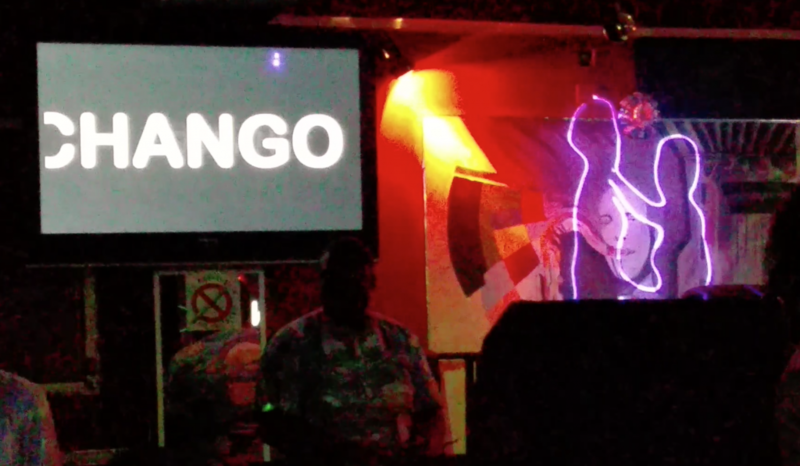 Indeed, as I arrived with Steve Lokonon’s Club Shango team at a place called Le Privilège in an evening of January, soon after our arrival a message was displayed on the two screens placed on both sides of the stage greeting and wishing us a happy new year. The visual element, whether it be the flag in Cuba or the written names and greetings in Benin, often replicate the singer’s greetings orally produced and spread through the microphone. The screens therein duplicate some communication features of language social codes where the mediated greetings and the address to audience members by artists are part of the local politics, ethics and aesthetics of speech. The screens act therein as a contemporary digital “post-griot” mediator creating a renewed interface and filter between the emitter and the receptors of the messages transmitted through the screens. According to my observations, the screens play different roles during the event that takes place in the venue. The screens and their content really become “actors” of the live performances (Aufderheide 1986: 57). They serve as a kind of waiting room animation. They are indeed really filling the waiting time before the concert starts or between the interludes. There, the screens are not only fulfilling an empty music space before the concert as a basic background noise but they are also really playing a role in the ambiance of the party. In so doing, they are therein replacing the role of the MC or any other dramatis personae who in Cuba or Benin and as elsewhere are making “the invariable attempts to involve the audience in performances (through quizzes between songs, dance competitions, etc. )” (Manuel 1987: 176). In this sense they are much more than part of the décor, they are really something to look at and react to. Whether it be the competitive screen in the Beninese scene described in the introduction or the redundant screens in Cuba, the screen become another dramatis personae of the event, fulfilling the visual landscape with either competitive or additional information about the band and the venue or even at an extreme extent of the scope of potentialities, displaying music videos with muted sound while other music, either played live or recorded, is broadcast in the venue. These competitive levels of visual and aural information saturate the space and the senses of the spectator while at the same time motivating cognitive reactions to these stimuli. As far as I could observe, people do really look at the screens even if they are with a large group of friends, it does not only provide the lonely researcher with a welcome composure! Moreover, the screens lead people to adapt their body attitudes during the event, either by orienting their body differently according to what is watched, either in direction of the screen or the stage, especially in the cases where the screens are scattered throughout the venue. People do react to what is displayed, acknowledging their appreciation of the songs broadcast, singing, moving and dancing, laughing to the candid cameras when there are. Indeed while seeing some moves performed by dancers on screen, at an individual level one might want to follow on and draw inspiration from to bring into their own improvised dancing; at a more collective level, the screen can lead a group of people to tacitly reproduce through their own bodies the choreographies displayed on screen, especially if the music is matching the screen content, as I could observe both in Benin and Cuba. In Havana, I was surprised that people invited me sometimes more often to dance to the music broadcast via the screens before and after than during the live concert. In such a recurrent way that dancing to the screen became then the antechamber and the way out of the live performances I went to. Allowing for an embodied response to the music they display, the screens appear to play both the role of appetizer and desert, preceding and following on the excitement of the concert. Furthermore, people interact with the screens in a similar manner as they do when the live performance starts, singing with the singer or responding to him, moving and dancing like the dancers. For instance, during a night at Casa de la Musica, the two big screens that frame the large stage on both sides were displaying a live performance of Pupy y los que son son just before the same band appeared on stage. I could then notice the continuity of the interaction that occurred between the audience and the screened band and then the live band. Again, the mise en abyme that occurred at that specific moment was particularly striking, blurring the notions of here and now, there and then, acknowledging how much “with screened music, fundamental shifts occur in the relations between performers and ‘audience’, something that continues to change as technology does” (Mera & Morcom 2009: 7). Besides, Michael Taussig’s theorisation of one of the two layers of the notion of “mimesis” as “a palpable, sensuous connection between the very body of the perceiver and the perceived” (1993: 21) allows for an understanding of the mediation process that comes and goes and links altogether the screens, the stage and the audience, each interface echoing each other in differentiated manners. Reflecting upon this conversation between screens, dancing bodies and stage performances led me to think more about the notion of videochoreomorphosis I elaborated earlier. From a work I have done on the interactions between dance and music videos in Mali, I proposed the notion of videochoreomorphosis as an analytical tool to appreciate how dance and dancing bodies are transformed by both the music video format and the audio-visual techniques. This notion encompasses both the aesthetical transformation that led to the creation of a new dance genre adapted to the music video and the changes in the transmission, practice and consumption of dance through this very media format. Furthermore, it addresses how the audiovisual format transforms a live body into a screen body (Dodds 2004: 29) thanks to several technological tools. If I therein applied this notion to the realm of music video making, the interactions I observed between bodies and screens within Beninese and Cuban music dance venues allow for an expansion of this analytical approach. Indeed, as live and screen bodies are interacting and improvising with each other, they are therefore creating another performance within the performance, informing and transforming each other. The way the screen and its content influence the body attitude of the listener/dancer even at a simple level (orienting one’s body towards the screen, moving to it) is part of the process of videochoreomorphosis. Moreover, by paying attention to the process of the transformation of the dancing body in its interaction with the video format, the notion of videochoreomorphosis helps then not only to apprehend how the live dancing body is transformed when it is captured in music videos but also how in return the screen body is able to impact the live body on the dance floor. The notion of videochoreomorphosis also includes the persons that are behind and/or between the dancers and the technological tools, whether it be cameras or screens. 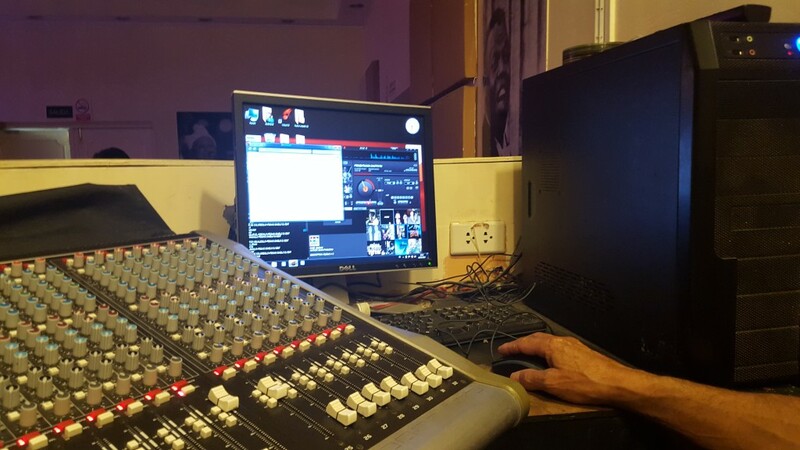 Thus, as well as the role of the cameras, directors and editors have to be taken into account when analysing music videos making, so has to be the role of the video-jockey as well as the layout of the screens within specific music dance venues. As much as the process of videochoreomorphosis allows for an understanding of the performativity and the interaction between objects – the screens – and subjects – dancers, audience, editors, video-jockey – within a specific space – nightclub, dance floor, music dance venue -, it also highlights how multi-layered and intricate are the relations between bodies, movements, live music performance and digital media that nowadays shape dance floors worldwide. From these preliminary observations, the ways in which these technological tools complement the musicians in the rolling out of the live performances highlight the complexity and the intricacy of music, dance and media interactions in a digital era that surely shape Caribbean and African if not global dance floor nowadays. In these particular settings where screens display music and dance images while at the same time other music dance components are simultaneously played live at the same space, this complicates further the issues that are already at stake when addressing music dance screen mediation for itself. In these cases where music and dance are simultaneously performed both on stage and on screens, not only “screened music involves and is in part defined by particularly complex processes of de- and re-contextualisation, and also trans-contextualisation, the ability of mediated musics (screened and other) to span contexts across time and space, transcending the boundaries of live performance” (Mera & Morcom 2009: 6), but it also implies that the audience has to deal with competing messages and aesthetics during the very live performance that nevertheless happens within a spatio-temporal unit, although additional screen media might suggest otherwise. The content of the screens then challenges further the apprehension of the dance floor temporality that has already its own interpretation. Even without evoking all the other screens that you encounter in a music dance venue at such a point that sometimes you only see the performance through a forest of smart phone screens creating a series of mise en abyme – a screen in a screen in a screen filming a screen ultimately displaying what is going on on stage – it remains that the plasma or projected screens give another set of information, either competing or complementary to the current event, that echoes the digital saturation of our everyday lives. Incarnating at once a certain “commodity fetishism” and “postmodernist aesthetics” (Taussig 1993) and appearing as the paragon of intermediality, the display of screens in music dance venues is certainly a major feature to interrogate further in order to get a better understanding of the intersection of economical, political and aesthetical issues that are at stake when you dance to a live band either in Cuba or in Benin. Appadurai Arjun (1996), Modernity At Large: Cultural Dimensions of Globalization, Minneapolis: University of Minnesota Press. Aufderheide Pat (1986), “Music Videos: The Look of the Sound”, Journal of Communication, p. 57-78. Djebbari Elina (forthcoming 2016) “Vidéochoréomorphose: Danses et vidéo-clips au Mali”, Volume! La revue des musiques populaires, Éditions Seteun. Dodds Sherril (2004), Dance on Screen. Genres and Media from Hollywood to Experimental Art, Basingstoke & New York: Palgrave Macmillan. Frith Simon (2002), “Look! Hear! The Uneasy Relationship of Music and Television”, Popular Music, Vol. 21, No. 3, p. 277-290. Goodwin Andrew (1992), Dancing in the Distraction Factory. Music Television and Popular Culture, Minneapolis, University of Minnesota Press. ”, Popular Music, Vol. 6, No. 2, p. 161-178. Mera Miguel & Morcom Anna (2009), “Introduction: Screened Music, Trans- contextualisation and Ethnomusicological Approaches”, Ethnomusicology Forum, 18:1, p. 3-19. Moore Robin (2001), “¿Revolución Con Pachanga? Dance Music In Socialist Cuba”, Canadian Journal of Latin American and Caribbean Studies / Revue canadienne des études latino-américaines et caraïbes, Vol. 26, No. 52, p. 151-177. Taussig Michael T. (1993), Mimesis and Alterity: a particular history of the senses, New York ; London: Routledge. All photos are courtesy of Elina Djebbari. ¹ See Djebbari Elina (forthcoming 2016) “Vidéochoréomorphose: Danses et vidéo-clips au Mali”, Volume! La revue des musiques populaires, Éditions Seteun.